Are you a fitness fanatic? Do you have professional training? If so, you may want to know how to start a personal training business. Better yet, you probably want to know how to grow it quickly. Here’s a guide that will help you. Personal training is a satisfying and fun career option for people who enjoy living an athletic, health-centered lifestyle. It gives you direct contact with your community and allows you to truly make a difference in the lives of others. There are a variety of roles you will qualify for after having received training. You can manage a gym or even work as an educator, running workshops and teaching others. The demand for personal trainers has grown in recent years and it’s continuing to. This profession is expected to grow 10% by 2026, a higher rate than other industries. If you want to know how to start a personal training business, you’re in the right place. This article will show you how to turn your love of fitness into a career. We’ll also cover some ways you can quickly grow that business. Just keep reading. What is a Typical Physical Therapy Aide Salary? If you’re interested in becoming a physical therapy aide, then you should know what type of salary to expect for your future. In this article, we’re discussing what you’ll be doing to earn that money and what a typical physical therapy aide salary is. In 2010, there was a recorded number of 63,800 certified physical therapist aide employed in the United States. Each of this therapist had a typical salary of $27,680. There is a projection that employment rate will bring an increase of 85,000 in 2020 with the physical therapy aide salary also rising. This implies that there are big opportunities in this area of expertise. So, if you’re interested in becoming a physical therapy aide, you should know what type of salary to expect for your future. And that is exactly what you’re going to learn in this piece. Furthermore, you’ll get to know what you’ll be doing to earn that salary. How to Launch an Online Personal Trainer Business? If you have a passion for fitness and an entrepreneurial spirit, an online personal trainer business may be the perfect career move. We’ll show you how. Jobs in personal training and fitness instruction will increase by 10% between 2016 and 2026, faster than the average expansion for all occupations. Many people have trouble reaching the recommended 30 minutes of exercise per day. The motivation and instruction of a personal trainer helps to keep them focused and working. A new development is the online personal trainer or coach. Available whenever and wherever a client needs them, the online personal trainer fills a specific niche. You have the passion for fitness and an entrepreneurial spirit, is a this a career for you? 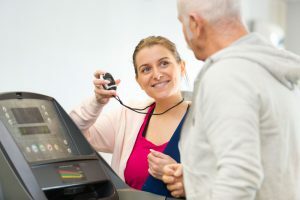 The education and training required for personal trainers vary by type of specialty, and certification is handled by several competing authorities. Let us show you how to become an online personal trainer. Read on for more. If fitness is your passion, you may be wondering how you can incorporate it into your career. Click here to discover how to start a personal trainer career. 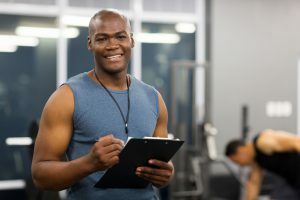 Becoming a personal trainer can net you a salary of $70,000 or more, but there’s much more to pursuing a personal trainer career than the money. It’s one of the most emotionally rewarding jobs around, where you’ll help people meet and beat their goals every single day of the week. There’s nothing more satisfying than seeing a grin shine through on a client’s face after a grueling, sweat-drenched session — you’ll both feel great afterward. If you’re serious about fitness and love helping other people, a personal trainer career could be the right choice for you. We’ve set out seven key things you need to consider before you get serious about starting your personal trainer career. Are you thinking about getting your personal training certificate? Don’t miss out on 10 reasons why you should become a fitness instructor. Click here. Do you love your time at the gym? Maybe you can’t imagine going a week without visiting your favorite workout spot a few times. Perhaps as you’re on your last rep, really feeling the burn, you think, ‘I love this. I wish I could get paid to do this’. Finding a personal trainer job with no experience doesn’t have to be difficult. Click here to find out how to land a training gig right out of the classroom. The quest for your first personal trainer job can be challenging. But as motivators, personal trainers know anything is within their grasp if they can just figure out how to do it. Still, it can seem almost impossible to find that first gig. You may not know where to get the necessary certifications, and if you do, you won’t know where to find jobs and people to work with. You may also have trouble finding ways in which you’re unique and can benefit potential clients.